Cross Harbor Facility Restoration - Railroad Construction Company Inc. 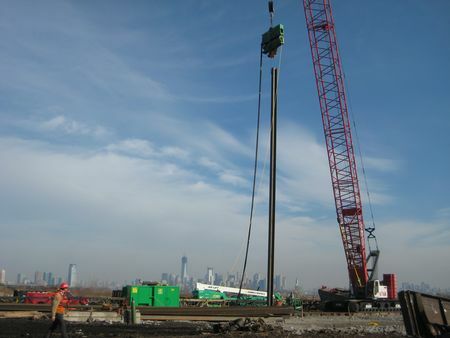 When Super Storm Sandy came thru the northeast, the Cross Harbor Facility in Jersey City, NJ was damaged and the structures had to be rebuilt. The Cross Harbor Facility is for loading service trains onto barges in Jersey City, NJ then sailing them across the river to Brooklyn, NY. The facility also receives service trains from Brooklyn. This is the Port Authority of NY & NJs only crossing for the service trains below Albany NY. Without this Harbor the trains would have to go north to Cross the Hudson in Albany, then come south to Brooklyn, extending transport time. Railroad Construction Company Inc. is in charge of the repair of the loading facility with a plan to remove a damaged bridge and build a new one in record time. The facility will have a floating ramp-bridge for driving the trains onto the barges. The Cross Harbor Facility needed to be in use as soon as possible. Matt Paquet, Project Manager from Railroad Construction Co, needed to run several shifts and several crews around the clock to keep up with deadlines. He has the help of Joe Quinn, Project Superintendent from Railroad Construction Co, Dock Builders from Local 1556 and 825 Operating Engineers. 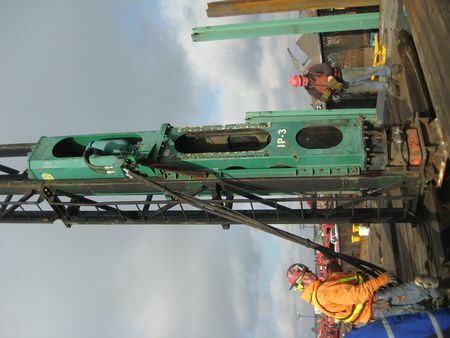 Matt contacted International Construction Equipment (ICE) for his pile driving equipment based upon his knowledge of their quality equipment & service. The fender system was damaged by the storm. The 1556 Dock builders had to pull several hundred timber piles from the previous fender system. The timber piles were pulled with an ICE 11-23 & ICE Model 40 wood clamp. There was also demolition of the old structures. 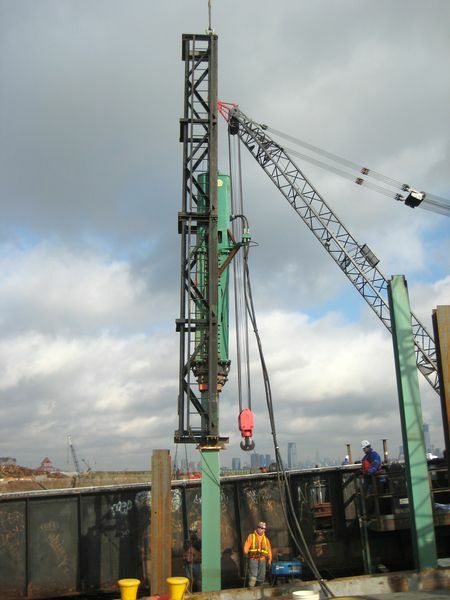 Railroad Construction Company Inc., had to drive H-piles for a pile cap and pier that hinges the float-bridge. The H-piles were W14 117 x 75 long. Some of the piles were vertical but a portion of them had a 1:6 batter. 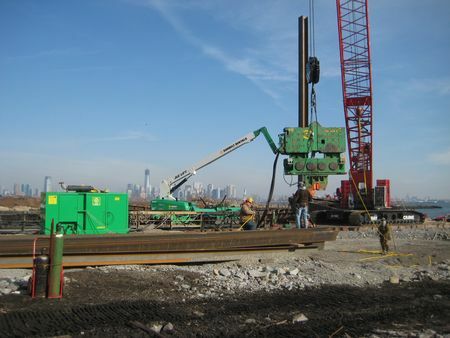 The first series of H-beams were driven to grade with an ICE IP-5 Hydraulic Impact Hammer & ICE Swinging Leads. The piles were driven to grade with no problems. There was also a 50 x 25 Cofferdam with 25 long sheets. They used an ICE 44B Vibro to drive the sheets. The next series of H-beams were pre-vibrated with the ICE 44B Vibro. Then they were driven to grade with an ICE IP-3 in an off shore lead set up. The piles were driven to grade on schedule. 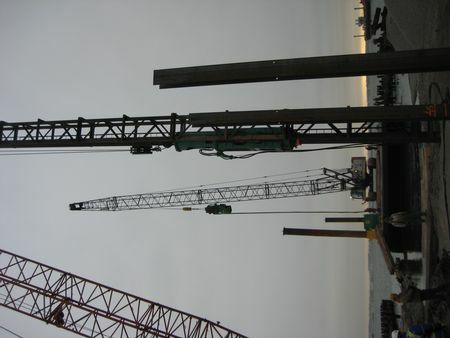 Most of the pile driving was uneventful, except for the cold, the tides, the nighttime work, and the tight schedule. The performance of the ICE equipment helped keep everything on track. The project completes early 2013 with movement of trains in some capacity before the end of 2012.